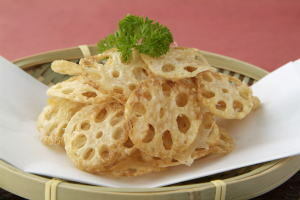 Renkon Chippusu ('レンコンチップス', is classified into deep-fried food), is known as Lotus Root Chips in English, and 炸莲藕片 (Zhà lián'ǒu piàn) in Chinese. Lotus Root Karaage, Renkon Karaage. Lotus Root, Salt, Potato Starch, Oil.